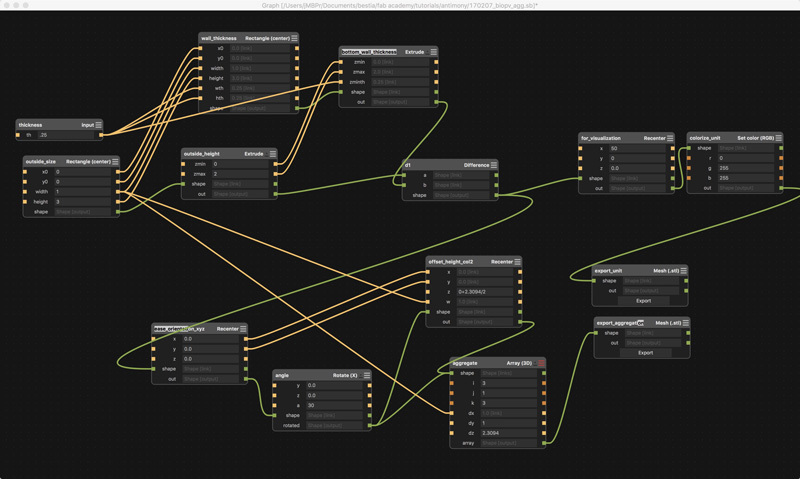 Antimony is an open-source, relying on graph composition where nodes represent primatives, 2d shapes, and loads of customizable operations and functions. 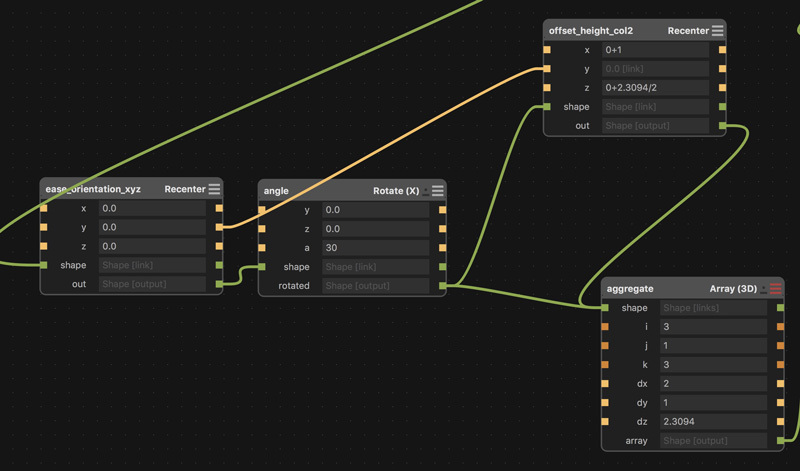 The graph has an GUI akin to Grasshopper, the infamous Rhinoceros plugin. 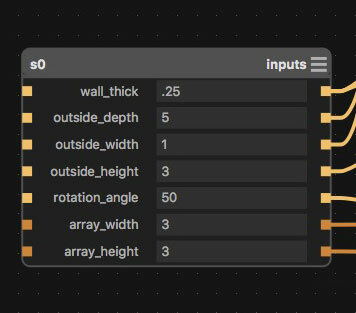 Antimony's interface includes a 3d viewport which has limited modeling capabilities that automatically log into the graph and a script editor. 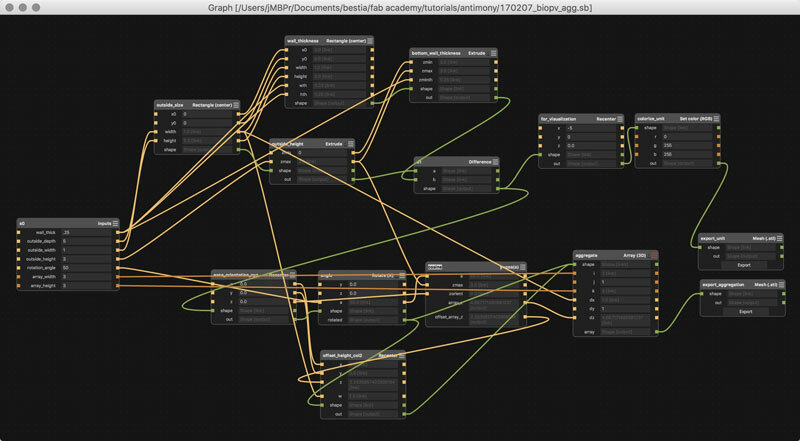 The script editor enables customization of all the graph nodes and is going to require more time for me to grasp. The advantage here is the algorithmic nature of the modeling. Changes can easily be applied throughout the entire history of the graph and propagate throughout the system. This way a decision made early in the modeling can be adjusted according to new information without breaking the series of subsequent decisions. Design versioning is fast. For me, there are a couple of limitations. 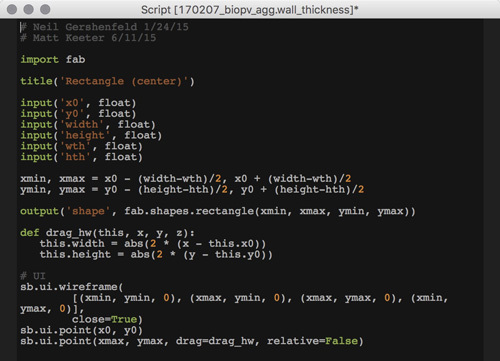 One, the scripting interface is a hurdle, at this point, simply due to a lack of education on the subject. Two, Antimony in its basic form works with obstensibly with solid primitives; meaning, custom shapes requires to step back to limitation number one. 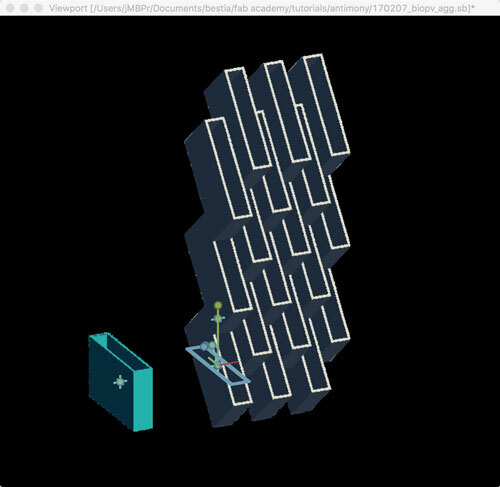 I jumped in, downloaded the free DMG build and found this five minute introductory tutorial which was plenty to get me going on the graph and viewport portions of the modeler. 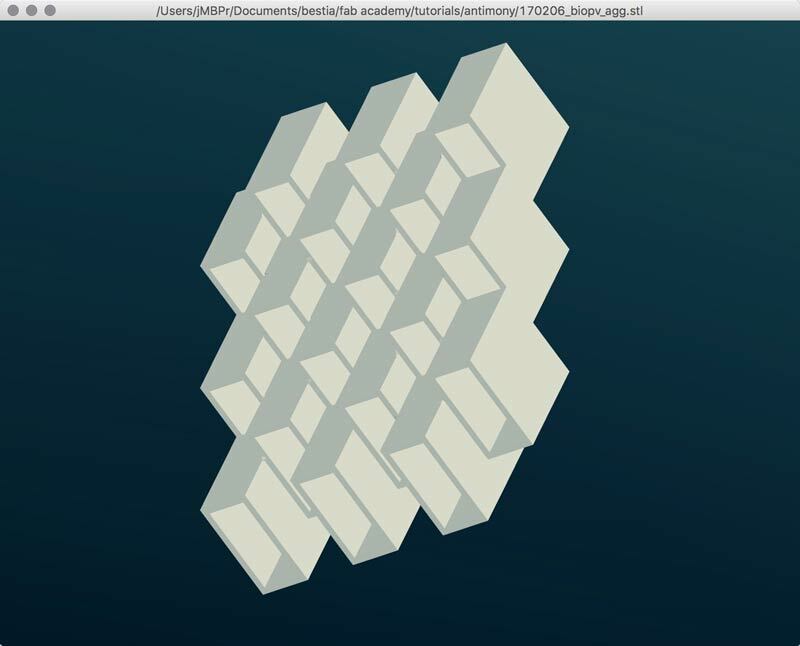 Antimony screencast from Matt Keeter on Vimeo. There are a few basic interfaces I will list here to save you time. Here is a screenshot from my own computer after completing the tutorial. #BaBoom. I will break it down. The unit is a rectangle with one side open. 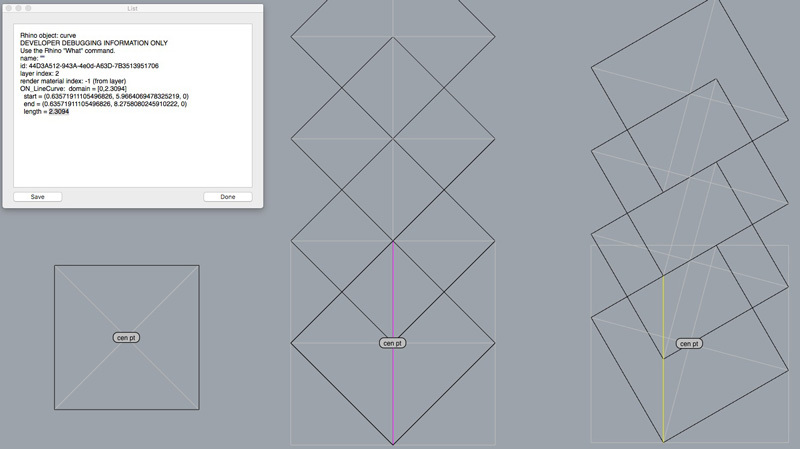 I started with two rectangle primitives, one for the outside dimensions and one to set the wall thickness. The "x0" and "y0" values are to set the origin of the center point of the rectangle. I need the thickness and outside rectangle to have the same center point, so the outputs of one are linked to the inputs of the other. Btw, in case of this model, all dimensions are relative. Straight away, it would be preferable to set the wall thickness in an equation: the output of the outside size into a thickness node that then spits the proper inside rectangle size to the wall_thickness node. That way I could simply update the outside size or the thickness value, rather than having to adjust each value in this current setup. In this model it is not a big deal; although, with added graph complexity labor increases exponentially. Next, the two shapes are extruded and the thickness of the bottom wall set by adjusting the "zmin" value of the thickness node. That will move the bottom of the primitive up the z-axis. For the hole in the top, the "zmax" of the thickness node should be at least equal to the outside height, thus the output of the outside height value is linked to the thickness node (a change in the overall height will automatically adjust the thickness so the unit will always be open at the top). In the graph, I was able to set these as simple equations because: math. The final step to get the unit is to difference the thickness from the outside primitive. Booleans are built into the CSG menu. "a" is the primary shape, "b" is the subtracting shape. The next step is to aggregate the units. First, to make subsequent calculations simpler, I recentered the unit to the origin of the grid: 0,0,0. Then, rotate the unit on the X-axis some value. Finally, array the unit. The array node is split into values for quantity: i,j,k corresponding to direction: x,y,z. Again, equations would be useful here. "dx" equals outside width multiplied by 2 (offset two columns). "dz" is more complicated. I will explain below. Because the even number columns are offset on the z-axis, the rotated output was split to a recenter node to move an initial unit into position for arraying. The recentered node can connect into the same aggregate input. I used another 2D CAD application to find the "dz" value by sketching the system to scale in elevation. In this case, a 2x2 unit rotate 30 degrees copied along a vertical line to an intersection point on the outside wall. Again, this operation should be capable of using an equation based on the outside dimensions and the rotation angle; it is beyond my ability tonight. 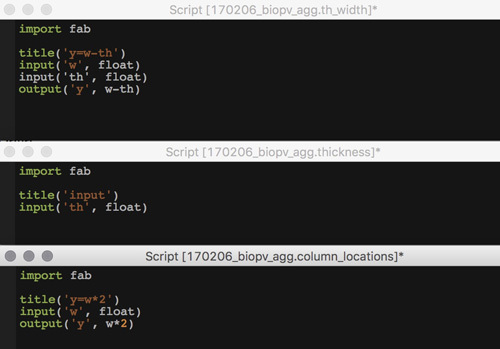 The found value is copied into the array node and divided in half for the second recenter node. 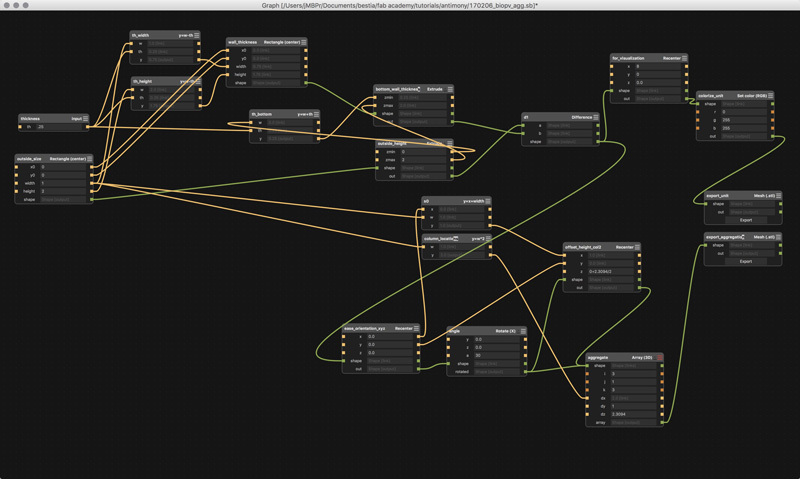 Finally, built into Antimony is an STL export node. 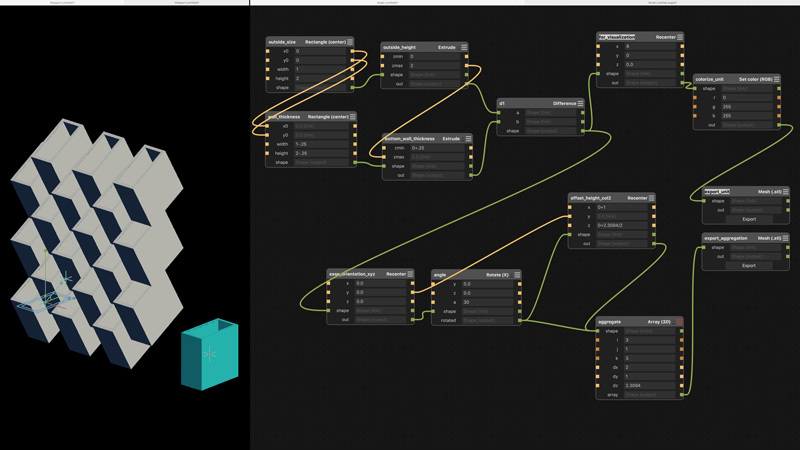 Plug a shape output into the export shape input, use the defaults and push out an STL file. The second image is the STL opened in FSTL, another free application from Matt Keeter. I do not know why it rotates the output 180 degrees on the Y axis. Looking at this, it appears yet inefficient. Although, it is operational. I believe I could edit the script in the thickness nodes to incorporate the now external formulas... And with the magic timelessness of the internet, success! Simply taking what I learned with the simple scripts one step forward, I could understand the preset scripts in the nodes and add some inputs and make little modifications to the formulas. In other words, customizing generic commands for specific needs. That is the whole point, right? 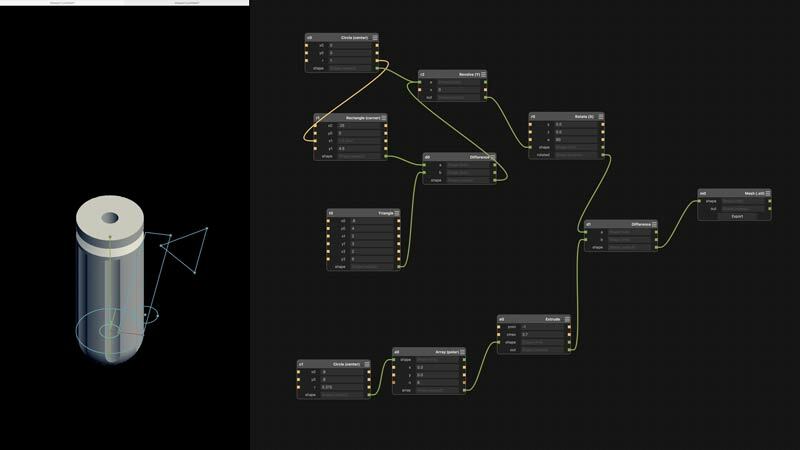 The graph screen, before and after. Update 2: As I was lying down for a nap, high school geometry came gushing from the depths of my suppressed memories. I was thinking of the Z-Array distance problem as a constrained CAD artist (find the intersection). When thought of as triangles, the solution is clearly a cosine formula. Reviewing this previous drawing, one angle is always square and one I set. Further, the length of the outside side, or height of the unit is set. 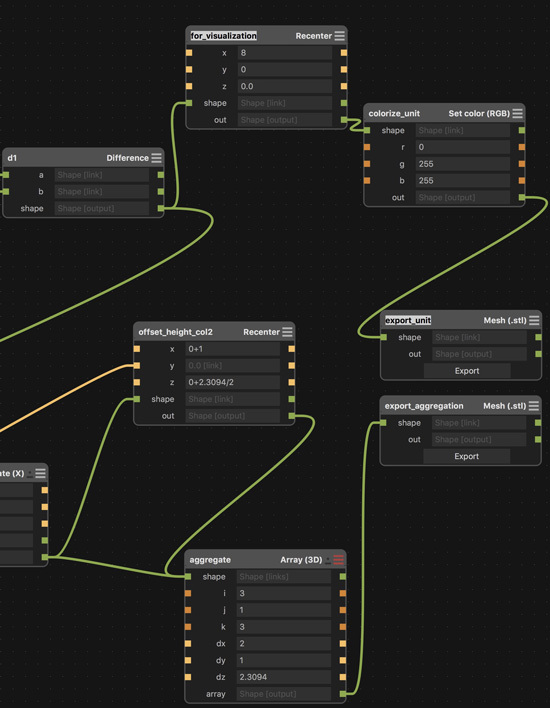 To simplify the interface, I made a master inputs node containing all the user-defined variables. Any change in this node propagates through the entire system and updates the model accordingly. And, finally, one screenshot of the final graph and one of the more attractive configurations I found after gleefully swapping numbers around for the last fifteen minutes. Antimony introduction : From Matt Keeter's blog. Very fast STL viewer : Download link. Also written by Matt Keeter. Antimony screencast : A brief introductory tutorial by Matt Keeter (building a screwdriver handle). Introducing Antimony... : An interview with Matt Keeter. Angle conversions : Little introduction to converting angles from degrees to radians and the other way too. Project file : My Antimony project file.